← How a doctor or nurse can prepare for a medical volunteer trip to Nepal since the April 2015 earthquake. CCNEPal Preliminary report for 2015, late May, part one, just the facts…..
note: I will depart Nepal for 2015 on May 30th. It’s a slow day and I thought I’d start this. The calendar year 2014 was summarized in a previous blog. Considerable detailed notes have been published here on a frequent basis. Add to this the tentative year-end total for 2015 – 690 – and the grand total is 2,130. 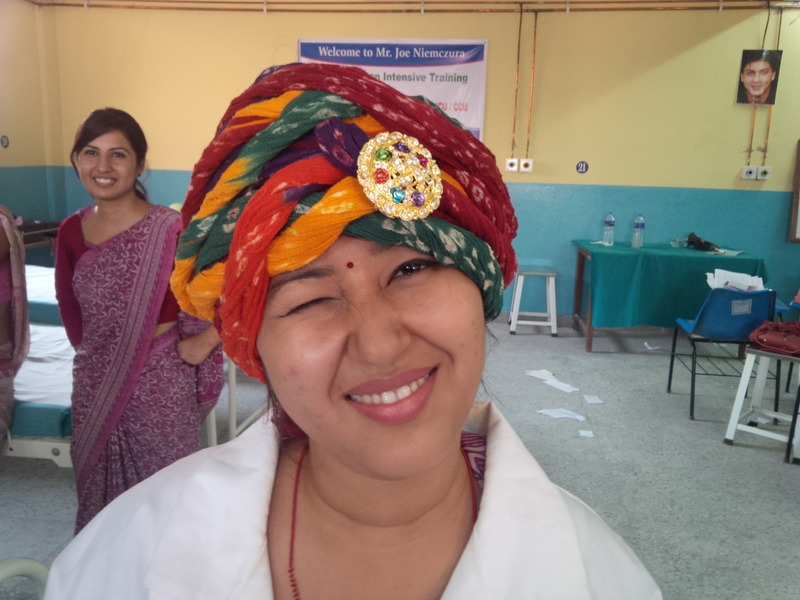 Since 2011, CCNEPal has awarded training certificates to 2,130 nurses and doctors. 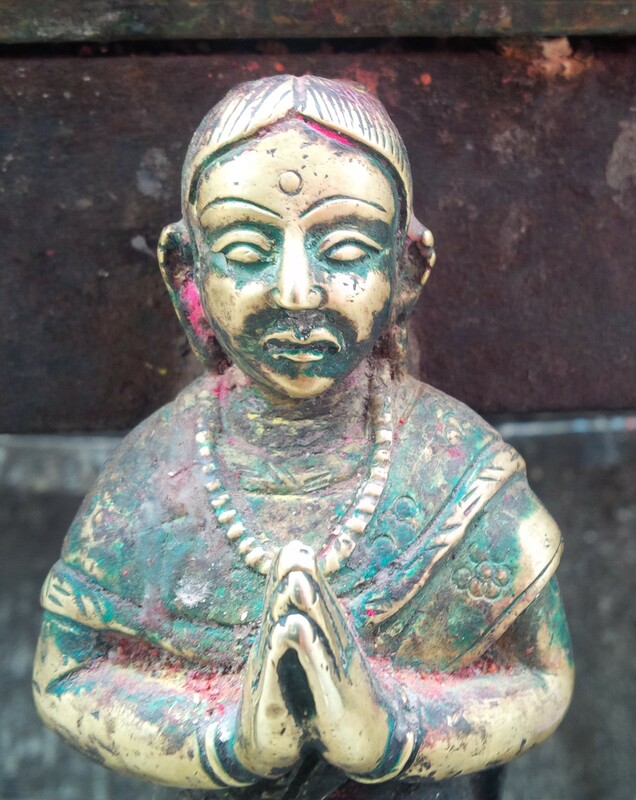 About 800 of these were in Kathmandu and the rest were in locations including Dulikhel, Biratnagar, Pokhara, Bhairawaha, Butwal, Palpa, and Bharatpur. The list included MBBS students or interns from Lumbini Medical College, College of Medical Sciences, Universal College of Medical Science, and Chitwan Medical College. When the course was given at Nepal Medical College in Jorpati, the anesthesia staff got trained in the teaching methods as well. Nursing staff from the two national heart hospitals (2013 for Shahid Gangalal National Heart Center and 2014 for Man Mohan Cardiovascular, Thoracic and Transplant Center), received this training, as did nurses from all four cath labs in Kathmandu. It is fair to say that there is somebody I trained, working in every ICU and ER in Kathmandu. The Center for Medical Simulation received their official Approval as an International Training center for ACLS and BLS with the American Heart Association in January 2015. The four nurses on their staff worked with me to learn how to conduct the megacode small-group work of ACLS, the heart and soul of the course. 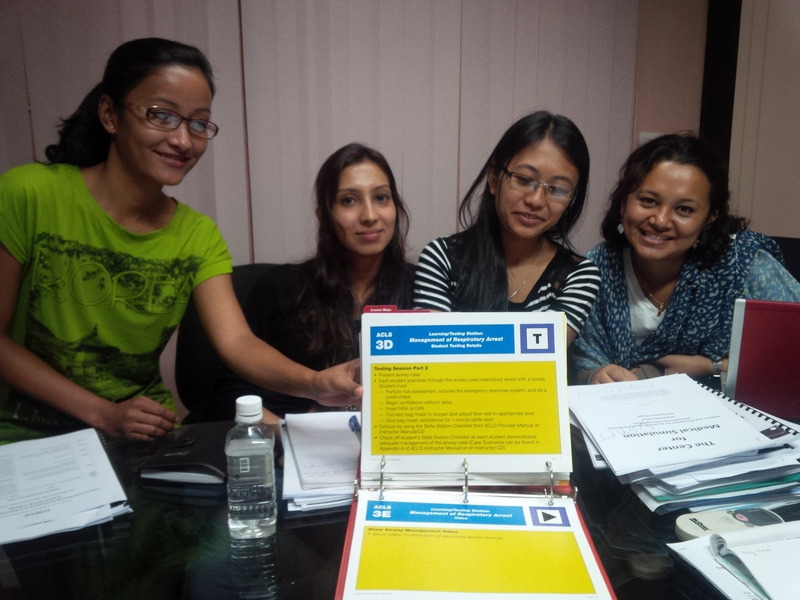 CCNEPal was pleased to train the teaching staff of the Center for Medical Simulation in Kathmandu. CCNEPal also served in an unpaid consultant role with Center for Medical Simulation to obtain their authorization as an International Training Center for BLS and ACLS via the American Heart Association – the only such in Nepal. CCNEPal continues to partner with Lalitpur Nursing Campus in Sanepa to maintain the Library. LNC has an inclusive policy of sharing their books with other nursing schools and nurses. One donation was the most recent “Procedure Manual for Critical Care Nursing” from AACN. Probably the only copy of this important resource, in the country of Nepal. CCNEPal shared all our teaching materials and resources with any person who brought a pen drive, and at the fall meeting of the Nepal Cardiology Society. Specific textbooks were donated to Lalitpur Nursing Campus, which has an open-access policy for nurses in Kathmandu. Click here. CCNEPal has developed a variety of inexpensive pieces of equipment that allows the course to be portable. 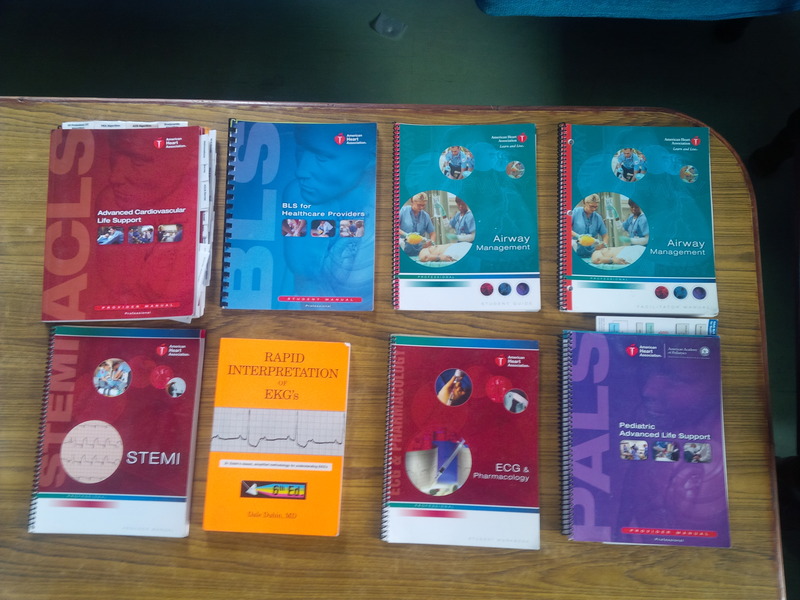 The collection of books from the American Heart Association were donated to Lalitpur Nursing Campus. LNC has a policy to share their texts with students from other nursing schools, as well as nurses. 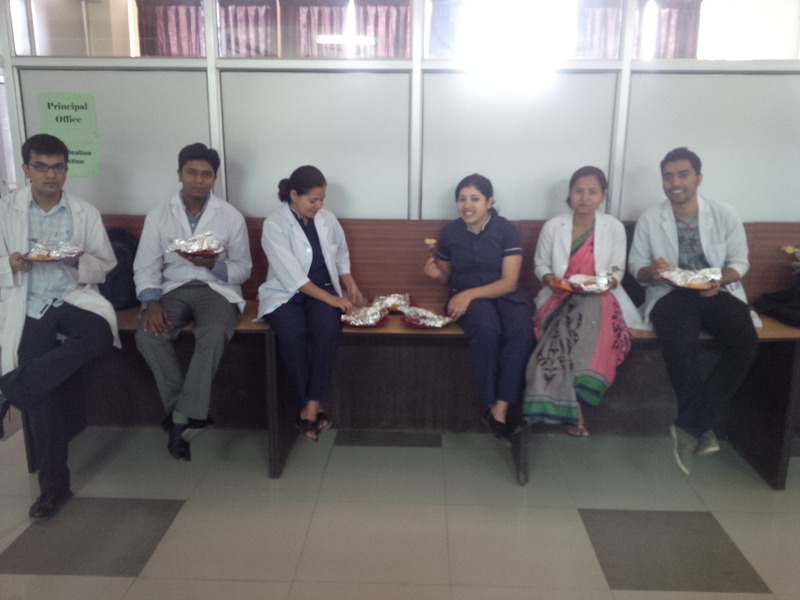 The critical care teaching crew at Chitwant Medical College Teaching Hospital is excellent. Their combination of teaching ability and clinical experience makes them the top critical care nursing education team in the country of Nepal, in my opinion. Also, in Bharatpur, the teaching staff of Chitwan Medical College worked with me for the four-session series; it is my considered opinion that CMC is able to teach this independently to a high standard, and I think they have proven themselves to be a resource for training for all of the Terai where fifty percent of the population resides. Lumbini Medical College – 4 sessions – 37, 37, 28 and 22. Due to my bus accident in January, I decided to make the travel schedule as efficient and compact as it could be. CCNEPal has historically spent 50% of time outside the Kathmandu Valley. Chitwan Medical College interns – 4 sessions – 30, 29, 30 and 30. Universal College of Medical Science, Bhairawaha – 5 sessions – 30, 16, 24, 26, 18. At each location I identified local clinical leaders who would serve as “assistants” in the course session, and I mentored them as they conducted the small group sessions in Nepal language. In some cases in 2015, these were persons who previously took the class and now were becoming more comfortable with teaching technique. There is now a cadre of about a hundred such persons, and they will be leaders in the future. The scenarios we use are adapted from the “Ten Core Cases” of AHA ( published elsewhere on this blog) It’s important to know that the course teaches more than just the resuscitation protocols; it allows the participant to learn about their own level of confidence, decisionmaking and clinical leadership. We have a heavy emphasis on Chapter three of the ACLS manual that goes over teamwork; We teach role development when we have an MBBS audience. It should be noted that we are not an official ACLS course from the American Heart Association and – we like it that way! CCNEPal’s policy is to conduct the smallgroup portion of each session in Nepali to the greatest extent possible. In this way, even though my own Nepali is limited, the participants got their questions answered in their best-understood language. personnel. I kept a blog (this one!) and made regular updates to it on subjects of critical care in Nepal, nursing education, and pedagogy of South Asia. This is part one. Because I have University-level teaching experience in USA, I build in a system of “praxis” to improve the course as I go along. You could call it “tweaking” I suppose but that does not capture the full thought process. I have analyzed the learning style of the students and the clinical needs. I will analyze impact and future directions in blog entries to follow. The short summary is, it is critically important for this skill set to become as widely adopted throughout Nepal as possible, and all strategies that bring it to a wide audience in the entire country, need to be considered. I would humbly suggest that CCNEPal has led the way in Nepal and that no other group has trained more personnel. I learned a lot about the Big Picture while doing this, and I have some very specific policy recommendations for any person or group that wishes to build on this work. Thousands of lives lost in the April 26th earthquake. Please pray for Nepal. This entry was posted in medical volunteer in Nepal and tagged ACLS in Nepal, CCNEPal year end report, critical care nursing in Nepal, Nepal disaster relief, Nepal Society for Critical Care Medicine, Nursing education in Nepal, The Center for Medical Simulation, volunteer as a nurse in Nepal. Bookmark the permalink. 6 Responses to CCNEPal Preliminary report for 2015, late May, part one, just the facts…..
Tough but stellar work. Kudos to you and to all those you trained. May we approach our daily lives and challenges in Nepal and in all our countries with your spirit ! I hope your own future will be rewarding for you, and I hope you plan to ” standby ” as a consultant at least, for those who will follow your trail….. Thank you so much for sharing so genuinely with all of us too !